It’s official. We’re now out in the middle of nowhere in the Vivorillos Cays, a mere freckle on the kneecap of Central America, right where the Honduran/Nicaraguan peninsula turns 90 degrees south. 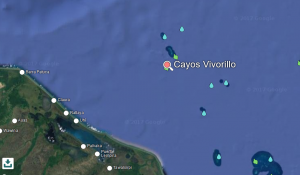 The cays are actually three islands running more or less north-to-south, two connected by an exposed reef, and the third to the south of the other two, with a fairly deep passage between them. The northernmost cay is a rookery with thousands of magnificent frigate birds and masked and brown boobies. The southern cay has a bit of a beach, and is home to a group of fishermen who come out here for months at a time, diving for conch and lobster, and selling their catch to “mother ships” that come by periodically. The guidebook we are using, Capt. John Raines “Cruising Ports: The Central American Route” gives this place mention as nothing more than a rest stop, and speaks about “incessant beggars and a murder of a cruiser that took place several years ago.” The incessant beggars part I just don’t get – how would they get here? We’re 30 miles offshore! And the “murder of a cruiser?” Gives me pause to think, but I think karma has something to do with things like that. We arrived here and dropped anchor at about 8:00 in the morning, after a 26-hour cruise that by all definition was a success. It could have been WAAAAAYYY worse. 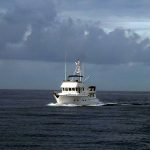 We had just 5-10 knots of wind for about half the time, and over the night/early morning, the wind picked up to 10-15, making for a bit of rolling, but we had just 4-6 foot seas off port bow with next to no wind chop. It was actually a pleasant enough ride to get some writing done on the computer. As we got closer, Strickly for Fun and Ketel Up bailed (must have been the bad write-up in the cruising guide) and opted to head straight for Providencia, another 200 miles and a sharp turn to the right. At about 3:00 a.m. we started seeing other boats out here, and quickly realized it was the Honduran fishing fleet. They pretty much stayed out of our way, and a little music on the i-Pod helped pass the time. 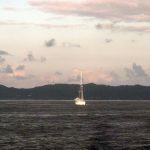 The anchorage itself is a bit exposed to anything other than straight north to south, and is quite rolly, but we are snugly anchored in about 11 feet of water. After a hearty breakfast of corned beef hash and poached eggs, it was off to bed for a six-hour nap.